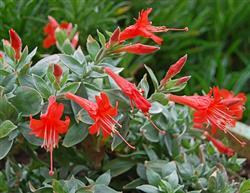 This fuchsia has a silvery green foliage that makes a beautiful contrast to its red blossoms. It makes for a stunning plant for bird and butterfly gardens or just in the garden. It is fairly cold hardy up to 15 F and makes a great choice for bordering pathways or lawns. I must not water this one as much as I should; it stays a tidy 18" x 18."